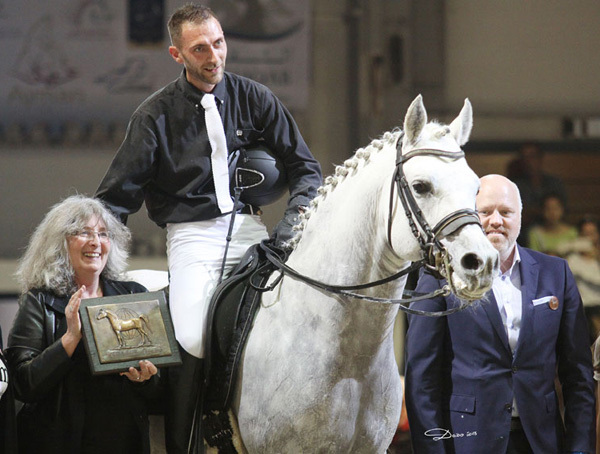 The Austrian Arab Horse Society has awarded their coveted 2015 Trophy to the stallion Exquisite’s Fantasy, who has truly proved to be a great ambassador for the Arabian breed. The Trophy was presented at the 2015 Austrian National Championships Show in Wels, in front of an appreciative audience. Foaled in 2002, by Gasir (Motamid / Braken) out of Exquisite Shatana (IH Shaklan Pasha / Exquisite Design), the grey colt Exquisite’s Fantasy was the first foal born at the new premises of Exquisite Arabians, on the Klammhöhe in lower Austria. His breeder chose his good-moving sire in particular for his superb temperament, which his son has inherited. He grew into a beautiful, flamboyant and very correct young stallion and, at four years old, he won the title of Austrian National Champion Stallion in excellent company in Wels. Started under saddle that same year, this friendly and cooperative horse soon showed great promise and over the years his patient, correct and sensitive training has certainly been rewarded. The partnership between Exquisite’s Fantasy and his rider, the talented Stefan Hirnböck, is now into its fifth year. Last year (2014) was the stallion’s most successful to date, beginning in February at the famous Stadl Paura where he impressed the evaluators and became licensed for warmblood breeding in Austria. 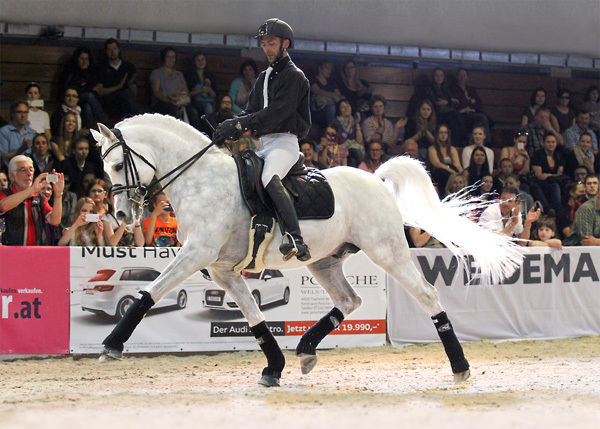 In May he put on a brilliant show at the Pferd Wels event with excerpts from his S level dressage repertoire. (European S level is equivalent to Advanced in the UK system, and Fourth and Fifth level in the USA training scale). His performance impressed the gathered crowds who soon took him to heart as a firm favourite and, while at the event, he was also honoured by the VVÖ (Arabian Horse Association of Austria). In August, he was presented at Styria, where the Trakehner Association approved and accepted him into their breeding books, allowing him to breed Trakehners. As Exquisite’s Fantasy is a tall Arabian at 1.60m, almost 16hh, he has a great deal to offer breeders of performance horses and his owner is delighted that he is now licensed with both breed societies. The highlight of the year, however, came with his victory in the dressage arena at Aachen, Germany. It certainly made the long journey a worthwhile one! On the occasion of the traditional Nations Cup is a dressage event open to all breeds, as well as Arabians and part-Arabians. In the dressage M** (equivalent to Advanced Medium, or Third level), Exquisite’s Fantasy took the win with a clear 8.0 point lead over all other international competitors, be they Arabians or mixed blood horses. EXQUISITE’s FANTASY performing Dressage up to high level. To end an excellent year, Stefan skilfully rode Exquisite’s Fantasy in the Horsebox Austria Cup, a high-class dressage cup for warmbloods, consisting of four competitions in the small tour S class in Austria. He placed tenth in the cup, scoring 64.211% in the first round, Prix St George, and 65.307% in the finale on the last day of the tournament in the FEI YR individual.